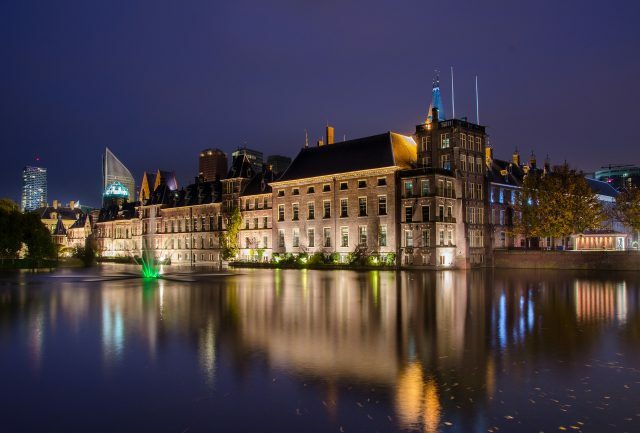 The Binnenhof, in the centre of The Hague. BRANDON, Man. – A pair of Brandon University (BU) students have doubled up on their international exchange options to earn a coveted semester abroad, studying human rights and international policy development at The Hague University in The Hague, The Netherlands. And for Ursula Geisler and her boyfriend Drew Spicer, just arranging the exchange provided some lessons in international negotiation — including a virtual stop in Green Bay, Wisconsin. Because BU doesn’t have a direct exchange agreement with The Hague University, Geisler and Spicer first secured an exchange from BU to the University of Wisconsin in Green Bay. Then, as registered students at Green Bay, they applied for and were accepted into the programs they wanted at The Hague. So, although they’re considered Green Bay students, they won’t ever go to Wisconsin. Instead, they’ll travel directly to learn in The Netherlands, and meanwhile they’ll continue to pay tuition to BU. “It becomes very convoluted,” laughed Spicer. The convolutions don’t stop there. Because the Dutch educational calendar doesn’t line up precisely with BU’s dates, Geisler and Spicer had to very carefully choose which classes they’d take at The Hague, to ensure they’d be back in Brandon in time to start their second semester. And, of course, the credits they earn in The Hague will first have to be transferred back to Green Bay, before being transferred from there back to BU. They courses, they say, are well worth all that trouble. “It will be very beneficial,” says Geisler, who is going into her third year of an Applied Disaster and Emergency Studies (ADES) degree — a program she sought out at BU from her and Spicer’s home in Whitehorse. In the future, she says she hopes to be involved in an international response team. At The Hague University, she and Spicer will be taking courses with a focus on European Studies, through the Faculty of Management and Organisation. Spicer, in his second year at BU with his eye on a future in rural and community development, says that The Hague’s courses with a legal and analytical focus intrigue him. David Rowland, who is Director of International Activities at BU, says that the university encourages international exchanges like this one, which is run through a non-profit consortium called the National Student Exchange (NSE). With a network of nearly 200 accredited, baccalaureate-granting colleges and universities in the United States, Canada, Guam, Puerto Rico and the U.S. Virgin Islands, NSE institutions are able to provide exchange opportunities for undergraduate students for whom an overseas experience is not appropriate, comfortable or affordable. Established in 1968, NSE has provided exchange opportunities to more than 105,000 students. Those students interested in participating in the National Student Exchange for Fall 2018 should contact David Rowland, Director of International Activities at rowlandd@brandonu.ca or drop by the Office of International Activities in the lower level of McMaster Hall (G-13) for more information. An info session for students will also be provided on Tuesday, Oct. 4 from 12:40 – 1:30 p.m. in the Elephant Room. This winter, BU will be welcoming its first-ever NSE participant, who is coming from Puerto Rico. Meanwhile, Geisler and Spicer spent the summer back at home in Whitehorse to earn money for their semester abroad and are about to drive back to Brandon for their trip to the Netherlands. “We’re both very excited,” Spicer said.